Fort Worden is an abandoned U.S. military seacoast defense located in the sleepy town of Port Townsend, Washington. For a week in 2010 I photographed the batteries (gun armaments) of the old fort with the goal of having a portfolio published in the fine art photography journal Lenswork. Once I returned to my home in Eugene and pored over the images, I realized had enough material to compile a book. 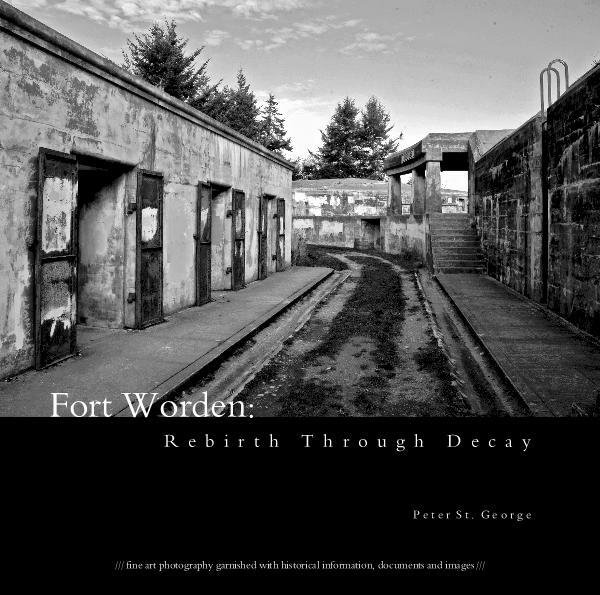 The book is titled Fort Worden: Rebirth Through Decay, and was completed September 2011. The majority of the book is comprised of fine art black and white images. The appendix is quite sizable, including an index of locations, map, history of Fort Worden, specific battery information, historical documents and historical images. This entry was posted in Uncategorized and tagged admiralty inlet, american military, american seacoast defense, batteries, bunkers, fine art photography, fort casey, fort flagler, fort worden, Fort Worden: Rebirth Through Decay, introduction, peter st. george, port townsend, puget sound, puget sound defense, puget sound naval shipyard, quimper peninsula, rebirth through decay, saint images, saintimages, saintprose, seacoast defense, strait of juan de fuca, triangle of fire, us army base, washington, washington state park, Washington State Parks and Recreation Commission, worden by Peter St. George. Bookmark the permalink.